Phnom Penh is a fascinating city that should be included in any trip to Cambodia. That sounds logical to include the capital and biggest city in Cambodia to your itinerary, but I’m surprised by how many people I meet who just go to Siem Reap and skip Phnom Penh. This guide is especially for first-time visitors to the city which will help make the most of your time. It’s useful for repeat visitors as well as I have picked out the best hotels in Phnom Penh for this list. 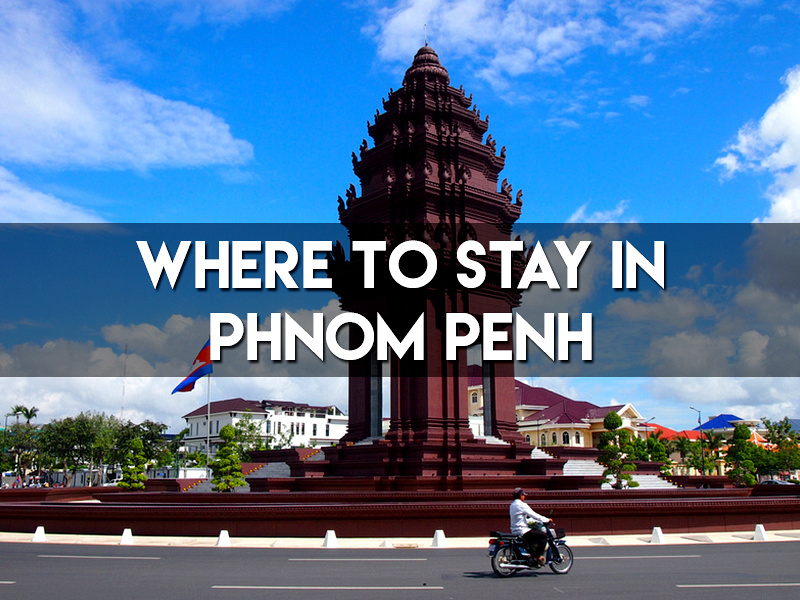 Having been to Phnom Penh numerous times I’ve found that these are the best areas to stay, depending on your travels. Daun Penh District includes the historic centre along the riverside. This where the royal palace, government buildings, and most notable colonial architecture can be found. Daun Penh is bounded by the Tonle Sap river, and the closer you can stay to the river the better. If you are visiting for a short time then confine your search to the area between the river and Preah Monivong Blvd. If you are staying west of Preah Monivong Blvd it gets too far to walk to the main areas, and tuk-tuks are quite expensive if you can’t haggle a good price. Within this area stay within Wat Phnom to the north and Preah Sihanouk Blvd to the south. Below Preah Sihanouk Blvd is the BKK1 area which is suitable for longer stays. Phnom Penh used to have a backpacker area at Boeng Kak Lake. The lake has since been filled in and is being redeveloped. There are a few streets that have a burgeoning hostel scene, though nothing on the scale of Khao San Road in Bangkok or Pham Ngu Lao in Saigon. 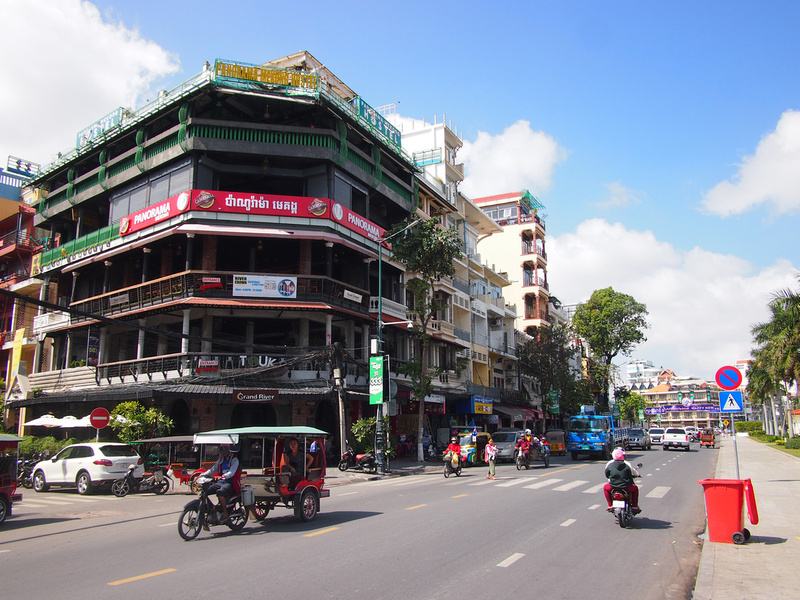 172 Street between 13 Street and Preah Norodom Blvd is one of the main backpacker streets. You could just turn up here and look around, but these days it’s better to book in advance. Onederz Phnom Penh is a popular choice for backpackers with its convenient location and good services and amenities. 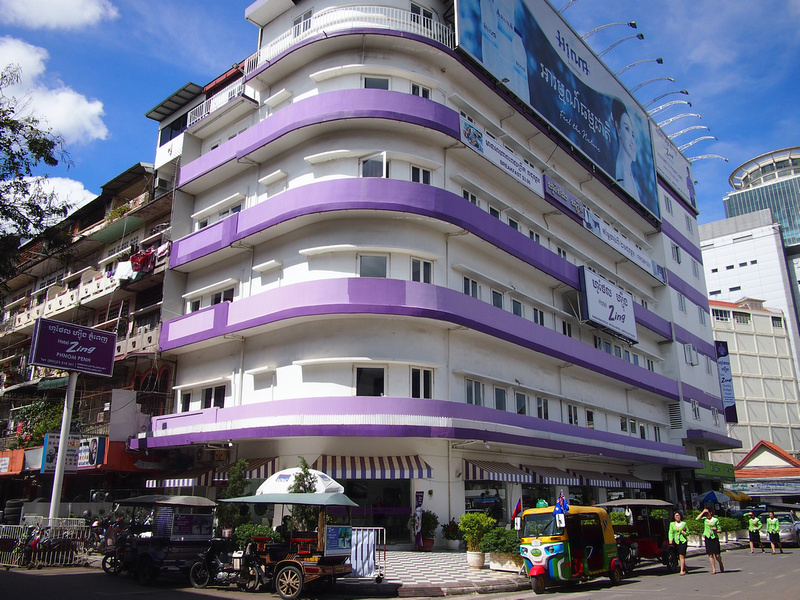 One Stop Hostel Phnom Penh is situated on Sisowath Quay, in front of the river. 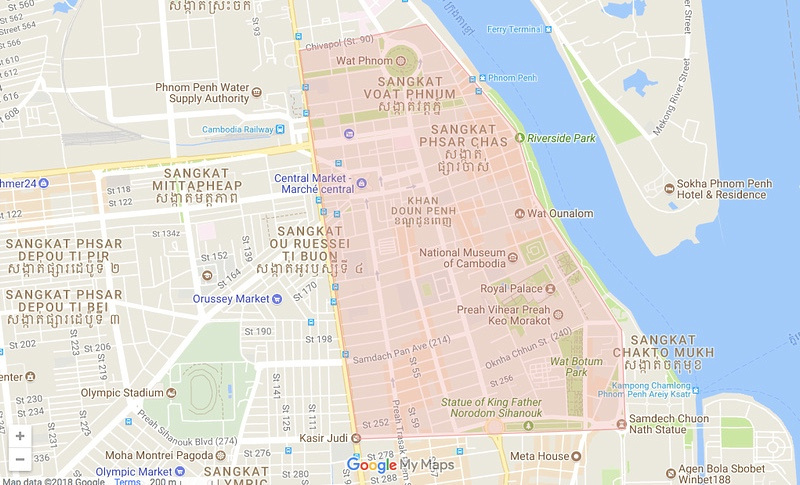 Panorama Mekong Hostel is located on the riverfront and it indeed offers a panoramic view of the Mekong where it converges with the Tonle Sap. I’ve stayed in a number of guesthouses in Phnom Penh over the years, and the quality varies greatly. I’ve found that the the cheapest ones are terrible compared to what you get in Vietnam or Thailand for the same price. By spending a few dollars more your accommodation experience will improve dramatically. TT Guest House is one of the budget options on 258 Street, which like 172 Street it has a small backpacker scene. Here is my review of what to expect from a budget guesthouse in Phnom Penh. 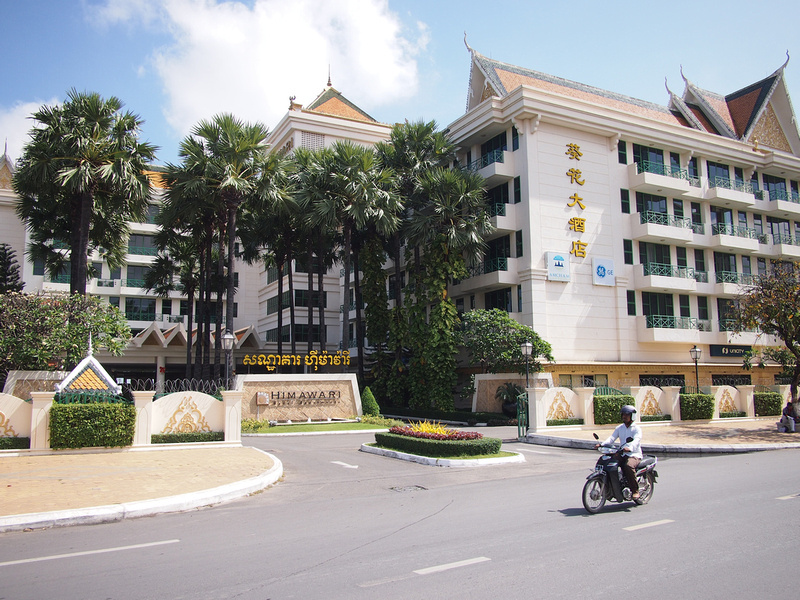 Phnom Penh Le Vincent Hotel is a 2-star hotel that is well-rated by budget travellers. Blue Lime Hotel – 3-star hotel. Zing is a 3-star hotel near the historic central market. It has a bright minimalist feel. I stayed here as it was convenient to the train station. Le Grand Palais Boutique Hotel is a mid-range hotel that looks like a classic apartment block in Paris. Himawari Hotel Apartments is a 4-star hotel situated on Sisowath Quay with magnificent views of the Tonle Sap River. 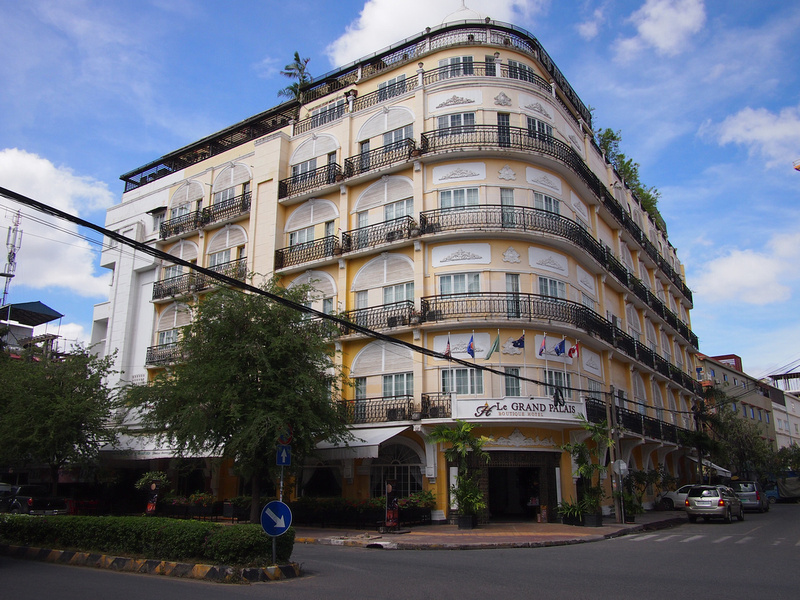 Hotel Cambodiana is a luxury hotel on the banks of the Mekong River. The hotel was built in the era of ‘New Khmer Architecture’ that flourished in the 1960’s. The hotel was finished in 1969 but was closed shortly thereafter due to the war. It was restored and reopened in the 1990’s, but now it is under threat of demolition to make way for new tower. If you are looking for something uniquely Cambodian, then stay here before everything has been turned into a chain hotel experience. 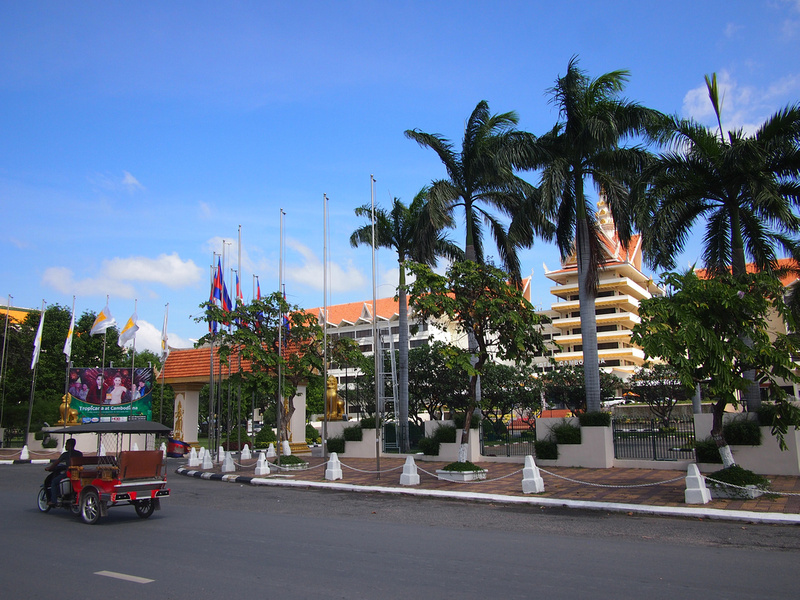 The Pavilion Hotel is located in the heart of the historical centre of Phnom Penh, near the Royal Palace and Wat Botum. 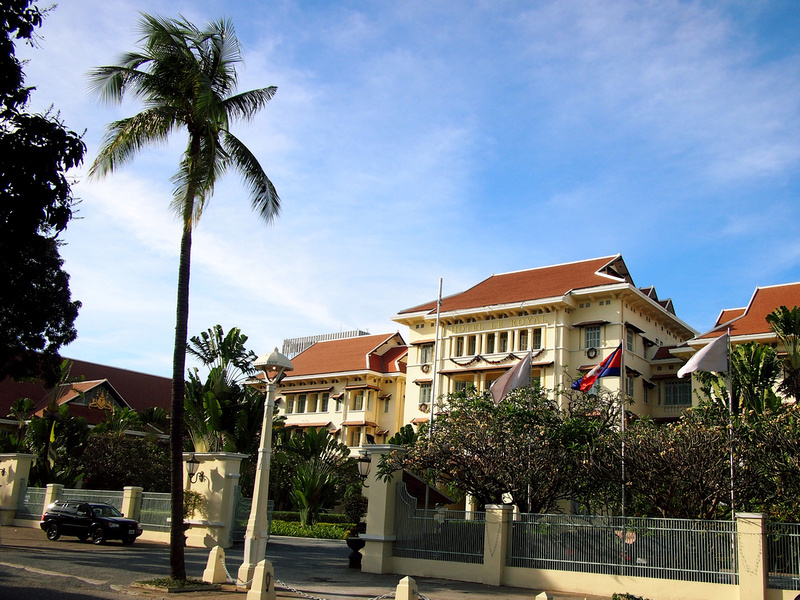 The architecture is a combination of Khmer and French colonial styles. It features unique heritage villas, indoor and outdoor swimming pools and private plunge pools, in a lush tropical compound. The big name hotel brands are still finding their way to Phnom Penh, so there are some unique hotel experiences to choose from in addition to a selection of familiar brands. Raffles Hotel Le Royal is a 5-star luxury hotel in a leafy area of old Phnom Penh. 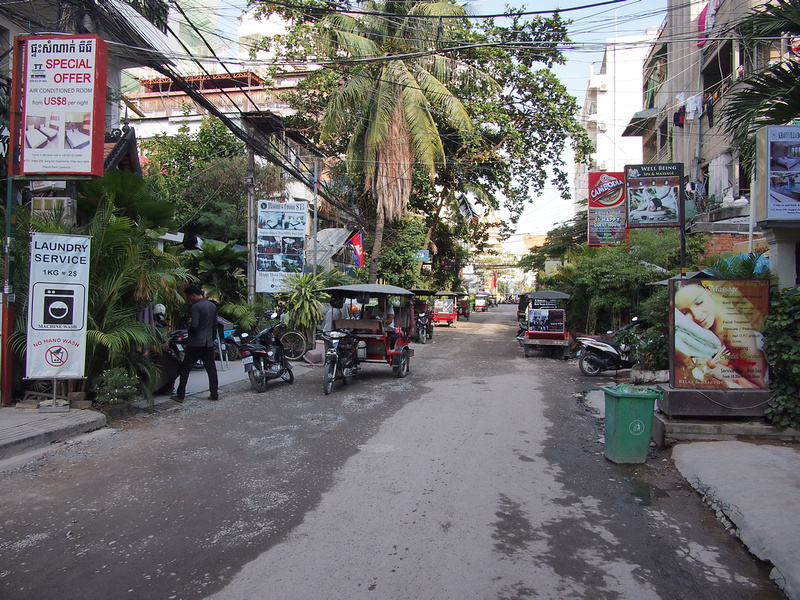 It’s next to Daun Penh Ave, which faces Wat Phnom and on the same street as the embassy of the United States of America. The hotel was originally named ‘Le Royal’ when it opened in 1929. Over the years it hosted a who’s who of celebrities, as well as journalists covering the civil war in the 1970’s. It is now fully restored and operated by the Raffles Hotels & Resorts. Palace Gate Hotel & Resort is situated between the Royal Palace and the river, making it ideal for sightseeing. This hotel with its pool and greenery will help you escape from the city chaos. 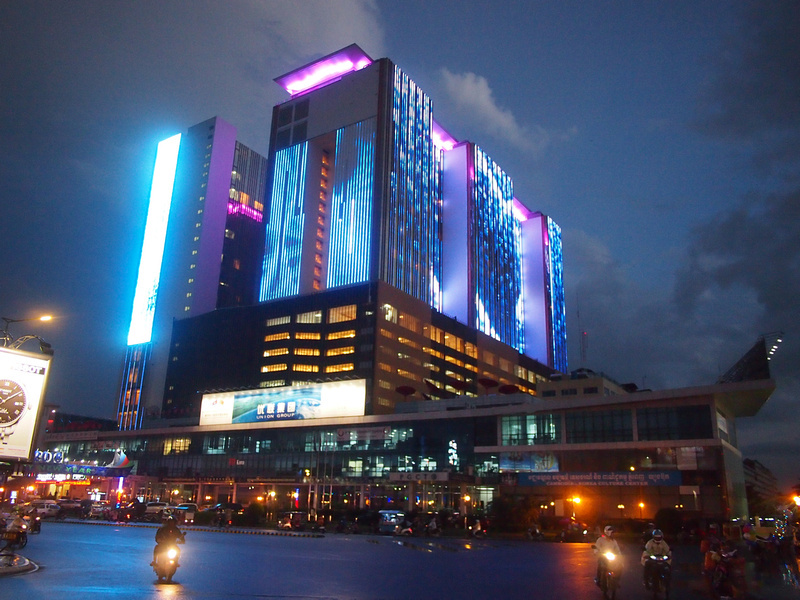 NagaWorld Hotel & Entertainment Complex is the gigantic casino that you will see glowing in the distance at night. While staying at a casino is not everyones cup of tea, if it is your cup of tea then it’s worth checking for deals. Like in Las Vegas or Macau, you can occasionally find a 5-star hotel room for $50. This area of Daun Penh is being redeveloped with new high rises and shopping malls, and it’s near the Diamond Island project. BKK1 stands for Boeung Keng Kang 1, and not an outpost of Bangkok (as my mind tries to tell me). If you are searching on hotel booking sites BKK1 is within Chamkar Morn District. 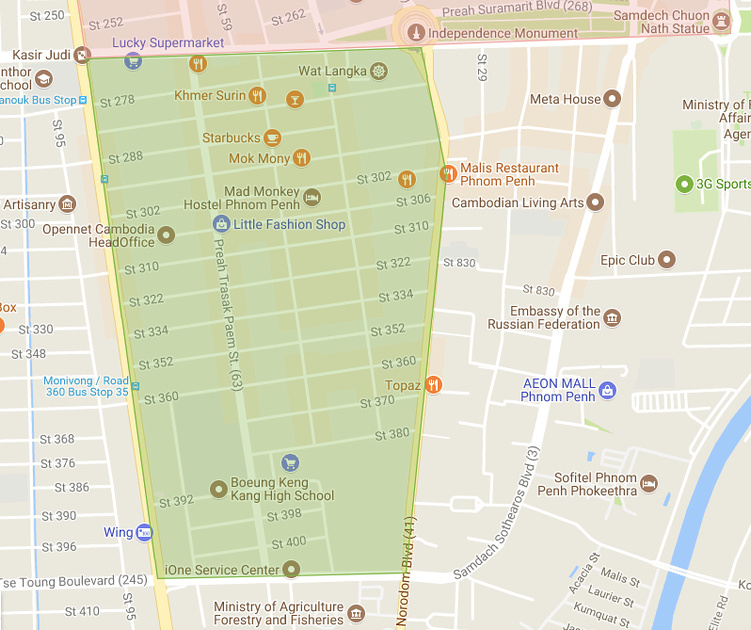 If you’re considering an extended stay or you’re looking for a digital nomad base in Phnom Penh then I would pick this area. It’s still close to the immediate centre while being less touristy. 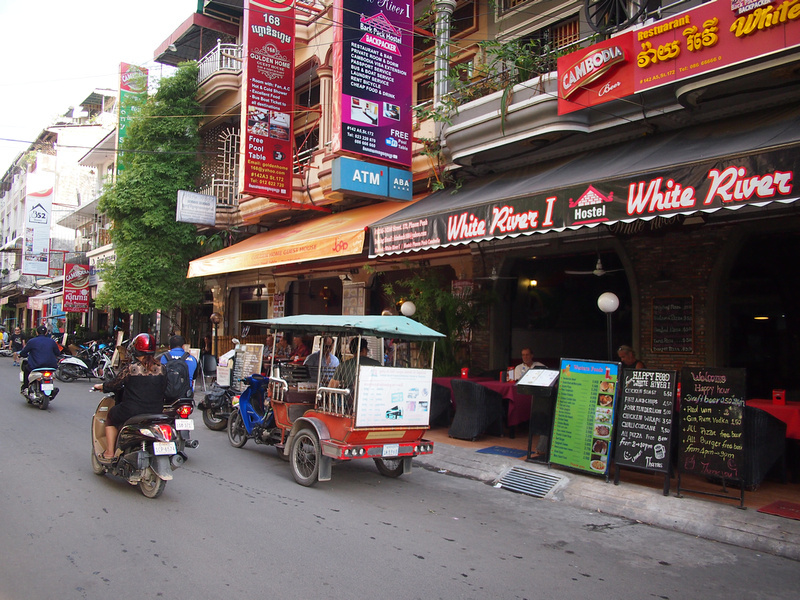 It’s a popular area for the expat/NGO residents, and there are lots of cafes and bars. The roads also feel slightly less chaotic (slightly). Accommodation options tend to be mid-range and upmarket boutique hotels. This would also be a good area to look for Airbnb rentals while looking for a longer-term place. If you’re new to Airbnb sign up with this link to get a first-time discount. Envoy Hostel Phnom Penh offers a combination of private and dormitory rooms. Feliz Hostel Cafe & Bar has dorm and private rooms available. Pandan Boutique Hotel is well-positioned in Chamkar Morn, close to Preah Sihanouk Blvd. Rambutan Resort – Phnom Penh is a small luxury mid-range hotel with a pool. Mansion 51 Hotel & Apartment is a 5-star luxury serviced apartment so a good option if you prefer to self cater. Search for more Hotels in Phnom Penh.